BettaBerries™ Antioxidant Blend is a delicious proprietary blend of many of the world's most phytonutrient-rich and well-known berries including Acai, Acerola, Maqui and Mangosteen. Bursting with a potent variety of vitamins, minerals, carotenes, protein and omega-3 fatty acids, BettaBerries™ Antioxidant Blend is a super-concentrated whole food. The combination of polyphenol compounds such as xanthones with the antioxidant resveratrol and flavonoids such as anthocyanins enable BettaBerries™ Antioxidant Blend to provide superior antioxidant support. As a synergistic whole food source, BettaBerries™ Antioxidant Blend supports cardiovascular and cellular health, as well as cognitive function. AcaiVida® A rich source of antioxidant compounds, particularly anthocyanins and Omega 3 fatty acids. Acerola One of the richest sources of Vitamin C. Acerola also contains a variety of mineral salts that can help stressed and tired skin to be remineralized. Amla Supports a healthy heart, promotes good blood circulation, aids cell regeneration, digestion and improves mental functions. Cranberry An abundant source of a unique subclass of flavonoids called proanthocyanidins. Goji Contains a complete spectrum of antioxidant carotenoids, including beta-carotene and zeaxanthin. JabuVital® Made from Jabuticaba, a deliciously sweet deep purple fruit that is rich in the unique antioxidant compound, jaboticabin. 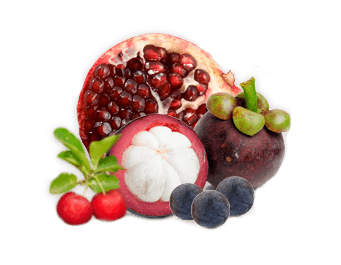 Mangosteen Particularly rich in a class of very potent antioxidants called xanthones. MaquiForza™ Contains astonishing levels of antioxidant compounds. Maqui has the highest ORAC level of any known berry. Pomegranate Contains high levels of ellagic acid, tannins and anthocyanins, which are potent antioxidants. XandraPure™ Contains essential oils, numerous acids, lignans, phytosterols, Vitamin C and Vitamin E.